hypotheses based on the necessary pedagogical criteria of teaching multiple classes successfully. H1. There is a significant difference between teachers' beliefs concerning inclusive education: teachers who teach classes where there are students with SEN as well have a much more positive opinion on inclusion compared to those who do not work with those students. H2. The respondents are familiar with the principles and methods of adaptive education, but the application of them in their teaching practice depends on the level of involvement in inclusion. H3. The methods of assessment of studentsâ&#x20AC;&#x2122; achievements differ based on whether the teacher teaches students with special educational needs or not. H4. The professional network of specially trained experts and teachers not teaching in heterogeneous groups is significantly weaker than that of teachers involved in inclusive education. THE RESEARCH SAMPLE Our department has a significant history of teacher education and training in Western Hungary. Participants of in-service teacher training courses organised by our institution come from schools of several regions who were invited via the electronic study system of the university to be involved in the present study, that is why we did not need to ask for permission from the school maintainers to authorize research data collection at schools. We invited all our part-time students (258 people) to take part in the research voluntarily, and 178 people joined. Figure 1 shows that the West Danubian region is significantly represented in the sample (79.8%). Regional distribution of participant teachers (N=178) is shown in Figure 1. Because of the uneven regional distribution of respondents, our survey data and findings can not be considered as representative. Our responders (24.7% male and 75.3% female) are divided into three sub-groups (Sg) because of the number of teaching hours in the different type of classes. (See Figure 2.) As Figure 2 shows, our responders in Sg-3, teach 10.3 hours a week in inclusive classes (s=9.02) and 11.10 hours a week in mainstream classes (s=9.78). Based on the responses gained we specified three sub-groups for proving our hypotheses. Sub-groups by rating and by teaching hours can be seen in Figure 2.
sd=1.23), and teachers who do not teach students with SEN (̅=2.61; sd=1.31) see the benefits the least. Taking the level of educational activity in inclusive education into consideration (see Figure 4), we can detect a significant difference in two issues based on respondents’ opinions. Teachers working with mainstream classes exclusively conceive inclusion as much more advantageous for their colleagues who therefore do not need to teach inclusive classes ( ̅=2.84; sd=1.32), than those who teach (̅=2.26; sd=1.17) only in this sort of study groups (t=-2.22; df=85.81; p=0.029). Their interpretation of inclusion is referred to as a kind of an ‘extra burden’. The level of participation in inclusive education, however, is proven to be a factor influencing the preferences of the methods although the inverse of our assumption was met. Those who teach only inclusive classes (N=47) use group work less often than those who (N=44) teach only mainstream groups (χ2(1)=10.99; p=0.001). Frontal work is more popular among teachers of inclusive classes, while respondents teaching only mainstream classes apply frontal work very rarely (χ2(1)=91.00; p=0.000). Among the methods listed in the survey (Figure 6), onethird of the respondents prefer explanation by the teacher, questions by the teacher, cooperative learning and homework. Reversed brainstorming, lecture-style instruction and brainstorming are the least favourite methods used by the respondents. The choice of methods is influenced by the teacher’s commitment to inclusive education in many ways. Teachers who teach exclusively mainstream classes (N=44) use cooperative methods more often than those (N=87) who teach both (inclusive and mainstream) type of study groups (χ2(2)=11.41; p=0.003). But creating mind maps is more typical for those (χ2(2)=8.19; p=0.017) who teach only inclusive classes (N=47). level of involvement in inclusion does not affect the assessment strategies significantly, which also outlines further research directions. Offering 15 possible options in our research tool, we also asked about the different aspects of assessment strategies used between each student group type. The respondents (N=178) marked 3.9 answers on average (sd=1.62; minimum: 0, maximum: 9). Most of them (84%) would provide a longer timeperiod for students with SEN to solve the tasks or give them fewer tasks to solve and / or help with understanding their text. One-third of our respondents (34.2%), however, believe that even students with special educational needs can be expected to work on tasks individually (Figure 7). The opinion of the respondents on checking and assessment is influenced by the composition of the study group in the case of oral testing. This method is not preferred by teachers who do not work with SEN students (Ď&#x2021;2 (1) = 3.91; p = 0.048). On the other hand, teachers who teach more lessons per week in inclusive classes use oral testing more frequently (t(176)=2.055, p=0.041). surprisingly, the frequency of contact is closely related to this rate (χ2(6)=70.16; p=0.000). More than half of the respondents communicate with a special education teacher on a daily or weekly basis, which seems to be irrespective of the number of students with SEN they teach (Figure 9). The purpose of networking with experts is not to improve the quality of the school’s approach to students with special educational needs. Nearly one-fifth of the respondents (18%) did not indicate any forms of networking (Figure 9) with the experts. The others reported three forms on average ( ̅=2.85; sd=1.875), and there was only one respondent who selected each of the predefined eight topics. Due to the disproportionate number of sample in sub-groups, our data needed to be weighed before comparison so that we counted the relative frequency of professional contacts in different sub-groups. Figure 10 shows that most of the daily cooperations (14.9%) are reported by teachers who teach only inclusive classes while the highest number of weekly contacts (10.3%) are reported by those teachers who teach both inclusive and mainstream classes. Based on our data it can be stated that the assistance of a special education teacher is most requested by the teachers in the sample to understand the characteristics of students with special educational needs better in order to apply appropriate instructional methods for their development (Figure 11). relationship with specially trained experts because of their interest in special educational needs. Despite four-fifth of the responders having an expert in their school, our research proves that those teachers who work mainly in the mainstream study groups have a more prosperous professional relationship with the specialists. 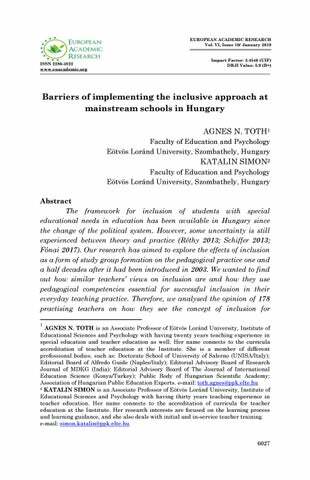 CONCLUSION The approach and principles of inclusion have been introduced to Hungarian teachers for less than 20 years, and many of them have met difficulties, according to researchers’ reports (Papp 2002; N. Tóth 2009; Réthy 2013) Our research data have proven the same. Our research aimed to explore whether the decade-long practice of inclusive education has influenced the approach of teachers towards inclusion and how they apply the pedagogical competencies needed for it in their day-to-day teaching practice. To prove our hypotheses, we analysed the opinion of 178 practising teachers in four areas: their attitude towards inclusive education, the methods they use in their teaching practice, strategies on student assessment and their cooperation with specially trained experts. Our assumption (H1) about the attitude of teachers educating students with SEN that shows a significant positive difference compared to teachers who do not perform these tasks represent some features of pedagogical practice experienced in our investigation which were not fully in line with our preconceptions. Those who do not teach an inclusive class at all consider the benefits of inclusion for SEN students solidly. Teachers who are not involved in this kind of management of diversity at all securely point out their positive feeling. According to our study, teachers in exclusively inclusive classes mention varied forms of assessment, but the level of involvement does not significantly influence the usage of methods and techniques. Our hypothesis, therefore, could not be proven in our sample. Inclusive teaching of SEN students is not a tradition in Hungarian education. Effective professional communities have a significant role in implementing innovative ideas and tackling barriers in teaching. Professional relationships are proven to be helpful (H4.) in dissolving pedagogical dilemmas related to the education of students with special educational needs (Papp 2002, RĂŠthy 2002, 2013, Schiffer 2013). Therefore, it was assumed that teachers who do not work in inclusive classes are less likely to have a strong contact with those who are specially trained than those who are involved in inclusive education. However, our data proved precisely the opposite. The extent of interest in inclusive education represents a more significant demand for professional networking by the teachers of mainstream study groups. According to our data, the aim of cooperation, therefore, is not to improve the institutional quality of adaptation in the education of students with special educational needs. Finally, there are some limitations of the research. A relatively small sample of our study (178 people) can not be compensated with the fact that it is based on a voluntary participation and with the number of focus areas, and it may distort reality, so it is mainly justified to conduct the subject in a much broader context and in a more in-depth way. Furthermore, the small size of the sub-groups and the distribution around the country do not allow us to extend the findings nation-wide. REFERENCES 1. Báthory, Z. 1997. Tanulók, iskolák – különbségek. Egy differenciális tanításelmélet vázlata. [Studens, schoolsdifferences. Outline of a Differential Teaching Theory.] OKKER Kiadó. Budapest. 2. Csányi, Y. 2013. Integráció/inklúzió és a szakvéleményezés összefüggései. [Relations of integration, inclusion and expertise.] Gyógypedagógiai Szemle. (3): 165-173. 3. Csapó, B. 2003. Az iskolai osztályok közötti különbségek és az oktatási rendszer demokratizálása. [Differences between school classes and democratization of the education system.] Iskolakultúra, (8): 102-117. 4. Grob, R., M. Holmeier, and P. Labudde. 2017. Formative Assessment to Support Students’ Competences in InquiryBased Science Education. Interdisciplinary Journal of Problem-Based Learning. 11(2): 1-7. 5. Fónai M. 2017. Recenzió Az Inkluzyv nevelés – inkluzív társadalom című könyvről. Párbeszéd - Szociális munka folyóirat (4) 2: 1-3. 6. Kárpáti, A. 2008. Tanárképzés, továbbképzés. In: Fazekas, K., J. Köllő, and J. Varga. 2008. Zöld könyv a magyar közoktatás megújításáért, [Green book for innovation of public education in Hungary.] ECOSTADT. 193–217. Budapest. 7. M. Nádasi, M. 2006. A differenciálástól az adaptivitásig. [From differentiation to adaptivity.] Fejlesztő Pedagógia, 17(6): 4-8. 8. Nahalka, I. 2013. Konstruktivizmus és nevelés. [Constructivism and education.] Neveléstudomány, (4): 21-33. http://nevelestudomany.elte.hu/downloads/2013/nevelestudom any_2013_4_21-33.pdf (22 July 2017) 9. Natriello, G., ed. 2013. Adaptive Educational Technologies: Tools for Learning, and for Learning About Learning. National Academy of Education. Washington, DC. 10. N. Tóth, Á. 2009. Tanári attitűdök és inkluzív nevelés. [Teachers’ attitudes and inclusive education.] Magyar Pedagógia, 109 (2): 105-120. 11. Papp, G. 2002. Tanulásban akadályozott gyermekek iskolai integrációja a szakemberek közötti kooperáció tükrében. [Integration of children with learning disabilities in the light of co-operation between professionals.] Magyar Pedagógia, 102(2): 159–178. 12. Réthy, E. 2002. A speciális szükségletű gyermekek nevelése, oktatása Európában (Az integráció és inklúzió elméleti és gyakorlati kérdései). [Educating Children with Special Needs in Europe (Theoretical and Practical Issues of Integration and Inclusion).] Magyar Pedagógia, 102(3): 281–300. 13. Réthy, E. 2013. Befogadás, méltányosság, az inkluzív pedagógia rendszere. [ Inclusion, fairness, the system of inclusive education.] Comenius Oktató és Kiadó Kft. Pécs. 14. Schiffer, Cs. 2013. A fejlődésközpontú didaktika alapjai. [The basics of development-oriented didactics.] ELTE Bárczi Gusztáv Gyógypedagógiai Kar. In: Digitális Tankönyvtár. 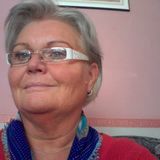 http://www.tankonyvtar.hu/hu/tartalom/tamop412A/20090007_a_fejlodeskozpontu_didaktika_alapjai/TANANYAG/01_ 0.html . (21 July 2017) 15. Tóth, E, Csapó, B. and Székely. L. 2010. Az iskolák és osztályok közötti különbségek alakulása a magyar iskolarendszerben. (Egy longitudinális vizsgálat eredményei). [Differences between schools and classes in the Hungarian system of education. (Results of a longitudinal study.)] Közgazdasági Szemle, (57): 798–814. 16. Tóth– Szerecz, Á. 2015. Sajátos nevelési igényű gyermekek az iskolarendszerben, inkluzív nevelés. (Students with SEN in Education System). Iskolakultúra. 2015/11.115-120.